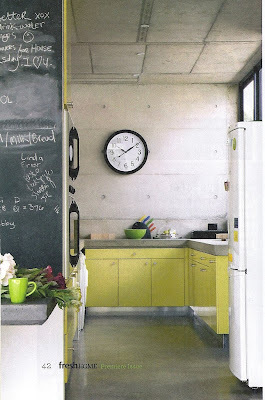 I'm surprising myself here, liking the fairly new look of concrete in homes. Concrete in and of itself is hard, cold, and boring (did I mention that's it's hard, because it is). My Puerto Rican abuela lived in a concrete house in an attempt to shelter her belongings from repeated hurricanes and other inclement island weather. She wasn't uppity or modern in any sense of the word and I loved the way her doilies would complement the harsh interior walls. 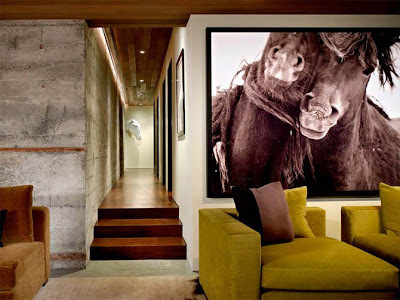 What do you think about concrete interiors? Are they too harsh for your liking or do you like the look? These concrete spaces look gorgeous. I can't see myself living in a home like this, but the concept must work great in hot climates. Thanks for sharing. i'm a huge fan of concrete kitchen countertops. love it. i think it looks clean and smart. On to concrete. 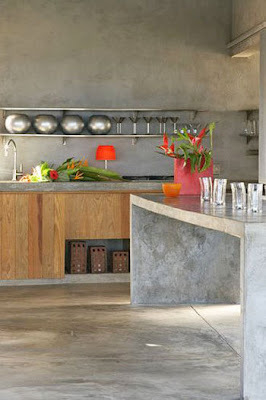 I LOVE the look of concrete countertops as well as floors. Esp when they are polished and not your typical sidewalk grey color either. Wether in a modern home, or a cozy country home they can look great. I do like the look. 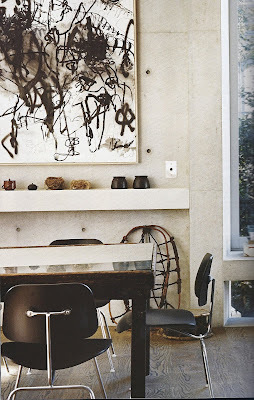 With the right decor I think concrete walls can look urban and chic rather than cold. I haven't been able to get behind the concrete trend. A bit too harsh for me. It kind of reminds me of a skate park or something. I think these spaces are beautiful, but not for me. Too cold! I think it looks cozy but I imagine it might be really cold for some reason. So funny, I just posted a blog on horse pictures used as art. Your first picture would have fit in perfectly!! I really like the picture from Fresh Home, with the pops of green, and the great blackboard. I was in kind of an industrial phase a while back. Now I could probably do concrete countertops, but not much more. I think concrete works in warmer climate, Trust me in New England the last thing you want is a cold concrete wall on a winter morning curled up by the fire. The may be phychological but the warmer you decor the warmer you feel in winter. I would be all for it, if I live in AZ! these designers really make concrete work! however, it would never work for me...to much of a romantic. Concrete can also be mixed with different colours so that the grey is not prevalent. You can also acid wash it to make it different. Concrete can be very warm as well! 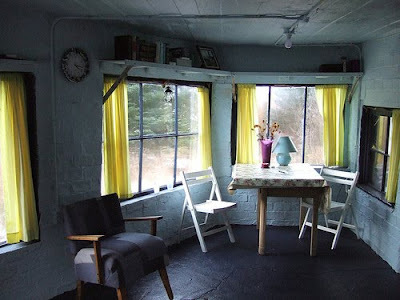 I have lived in concrete homes all my life so I knew nothing else until i move to North America. These types of homes can be very warm & inviting. Concrete homes are commonly used in contries where the weather is mostly hot. Interesting blog. Love that concrete, in the right light, in the right place. What a cool idea. I never would have considered concrete but the pictures above prove to me otherwise. They do not look harsh to me, but I think you have to make concrete look softer with the help of textiles and lighting and warm colors. Love these images! I LIKE IT!!! a few years back a museum i worked at put polished concrete floors in the bookstore. some kind of gorgeous swirly color was also put on the floor before they sealed it with some kind of clear coat. i am not explaining well, but it is AMAZING. and it looks easy to clean which is a biggie in my book! 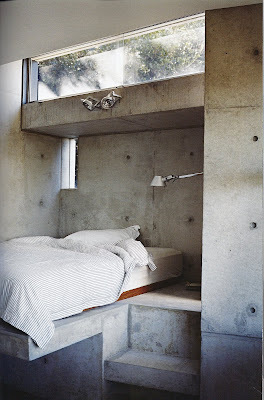 I absolutely adore the look of these concrete abodes! Also, since there is so much information out there concerning tinting, glazing, staining, etc., concrete (mostly floors), I can only imagine the endless possibilities to change the 'grey monotone-ness' of these concrete walls! Love this - sometimes can be a bit cold but large scale art like that gorgeous piece in the top photo is the perfect way to 'add a soul' to the space. I really love the first picture with the Sable Island horses! those are all beautiful interiors...i think personally, it would be a bit too cold for my taste, but i do appreciate the look! some of them are too harsh for me, but i do like the 4th one, i think the sunny cabinetry helps balance it out nicely! I'm a fan. I think I might love them in the kitchen; but not so sure how I feel about them in the bedroom. Great photos, btw. It certainly is different (& a bit too "harsh" for my tastes) but I do enjoy looking at it, especially paired with bright colours. i'm a big fan actually. saw it once on HGTV and couldn't believe how amazing it looks in a kitchen. I actually dont mind it at all..I think it looks better in large open spaces with beautiful furniture pieces and artwork to compliment it. p.s. i have a puertorican abuela too! aren't they the best. Such a great post!! I think about concrete a lot for re-doing my upstairs floor, but then the thought of the cold always gets to me in the end. LOVE that photo of the horses in the first one!!! 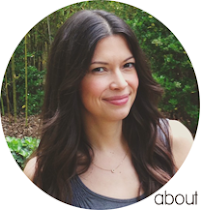 Have a great weekend Christina! I actually don't mind concrete interiors! LOVING that large horse photo in the first image! What a fabulous compilation. Whoever thought concrete could be so fantastic. Concrete can capture the subtle layers and patterns and texture of all the earthly delights. Sand and wood, and leaf and water. It can be soft to the eye, and strong to the touch. Still, too much is just can be beyond enough.